Baylor’s Noah Horst drives against Donaldson’s Grayson Perez at 126 in the quarterfinals. 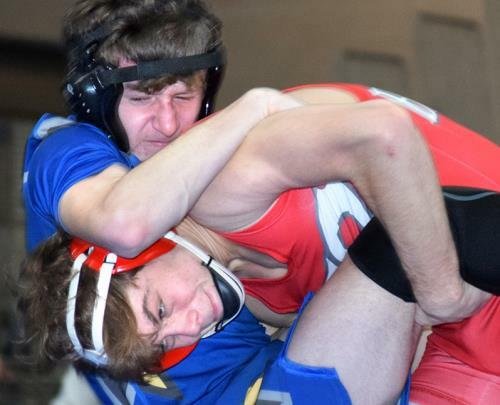 Saturday was an incredibly important day for high school wrestlers in the Chattanooga area as region competition was held in four locations with the all-important state qualifiers for next week’s traditional tournament on the line. The reigning D-II state duals champion Baylor Red Raiders claimed six individual winners among their 13 state qualifiers as they won the Division II East-Middle Region at McCallie with 241.5 points. Runner-up McCallie had four champs among a dozen qualifiers to finish the one-day event with 222 points. Montgomery Bell Academy was third with 134.5 while Chattanooga Christian was fourth with 78. Christian Academy of Knoxville and Knoxville Grace tied for fifth with 60 points each. Notre Dame was seventh with 59 points while Boyd-Buchanan was ninth with 36 points. “I think we had a pretty good day as we did about what we thought we could do,” said Baylor coach Ben Nelson following the last match. “We advanced 13 of 14 to next week as we’re just trying to keep the momentum going from last week’s state duals win. Our goal was to stay focused and it paid off,” Nelson added. “That was just another good team effort,” said Baylor assistant coach Shane Turner. “We aren’t always super great, but we always fight and that’s what I like about these kids. “Jason Motley was an unseeded wrestler at 152 who advanced to the finals and Jackson Bond beat a really good kid at 106. Garrison Dendy is a freshman who beat a good senior at 132, so that was special as well. We just have to keep it going for one more week,” Turner nodded. McCallie coach Jake Yost is always looking for ways to do better. Overall, he was pleased with the performance of his Blue Tornado wrestlers on Saturday. “We always think we could have done better, but we got 12 through and did pretty well overall,” he said while the mats were being rolled up. “We lost three matches in the finals to really tough kids. Christian Morris did a great job at 126 before losing in overtime and Nathan Wysong’s match at 132 was closer than the score. And we gave up a last-second reverse at 113. We always grade our kids on attitude and effort as the scoreboard will take care of itself. “We always want more, but for the most part, I thought we did a good job. I know that next weekend will be another war between us and Baylor, but Christian Brothers and Father Ryan will be in the mix as well,” Yost concluded. Baylor’s six champs included Bond at 106, Noah Horst at 126, Dendy at 132, Andrew Pace at 145, Mason Reiniche at 170 and David Harper at 195. McCallie’s four champs included Emory Taylor at 120, Zach Ward at 138, Alex Whitworth at 152 and Thomas Sell at 182. Other individual winners included Notre Dame’s Cade Holloway at 113, Gavin Cagle of CAK at 160, MBA’s Dominic Fisher at 220 and Ryan Jackson of Friendship Christian at 285. HIXSON CRUISED to victory in the Region 2-A/AA tournament at Alcoa as the Wildcats advanced all 14 individuals while winning nine championship matches and scoring 263.5 points. Host Alcoa was second with 155 while Chattanooga Central was third with 91 and Polk County fourth with 51. Brainerd and Tyner tied for seventh with 26 points apiece while Sale Creek was 10th with 19 points. Champions for Hixson included Conner Leffew at 106, Trevor Lewis at 120, Charles Burton at 126, Jeremiah Shackleford at 132, Rylie Hart at 138, Jordan Lewis at 145, Marcus Hester at 160, Hector Nunez Hernandez at 195 and Devotis McCurdy at 285. Other winners included Central’s Haiden Dill at 113, Alcoa’s trio of Anthony Jones at 152, Eli Hagy at 182 and Noah Evans at 220 and Upperman’s Caleb West at 170. NOLENSVILLE WAS the team champ in the Region 3-A/AA gathering at Eagleville with 224 points while Signal Mountain was the runner-up with 185.5. Whitwell was fourth with 151 while Red Bank and Sequatchie County tied for sixgth with 67. East Ridge and Howard were 11th and 12th with 29 and nine points, respectively. Signal Mountain had nine qualifiers for next week, including three champs. Daniel Uhorchuk was victorious at 113 while Kale Albritton was the winner at 126 and Sam Wickizer first at 132. Nolensville had five champs while Forrest had four. Eagleville and Whitwell had one each. CLEVELAND AND Bradley both qualified all 14 individuals as they finished one-two in the Region 4-AAA tournament at Ooltewah. The defending state champ Blue Raiders had nine champs as they scored 260.5 points while Bradley had three winners to finish second with 213 points. Walker Valley was third with 112 points while East Hamilton and Ooltewah tied for fifth with 75. Soddy Daisy was sixth with 66 points. Cleveland’s winners included Trae McDaniel (106), Jackson Bradford (113), Logan Whiteside (132), Cael Laxton (138), Grant Lundy (145), Austin Sweeney (152), Zach Brezna (160), Dylan Jones (182) and Wilson Benefield (220). Bradley’s three champs included Wesley Devaney at 120, Daniel Mroz at 126 and D.J. Gibson at 195. Other 4-AAA champs included Cade Meeks of East Hamilton at 170 and Walker Valley’s Jadon Langford at 285. The traditional state tournament will begin for public schools on Thursday afternoon while all the private schools join the competition on Friday morning. Championship finals in all classifications will be contested early Saturday evening with all matches being held at the Williamson County Agricultural Exposition Park in Franklin.